Teaching Nurses How To Speak Up — And Speak Gently : Goats and Soda In all parts of the world, nurses deliver most of a patient's care — especially in countries with limited medical resources. But who will train these nurses? Partners in Health has a plan. 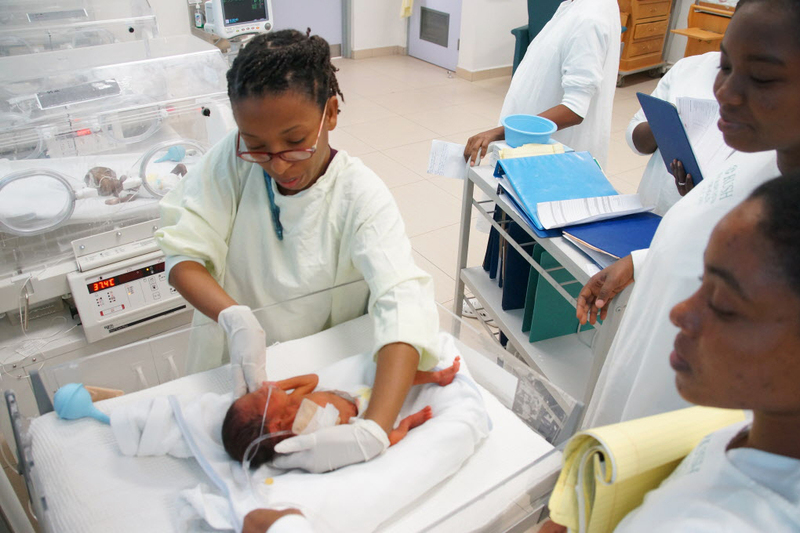 Chief nursing officer Marc Julmisse (in glasses) leads nursing rounds inside the neonatal intensive care unit of the University Hospital in Mirebalais, Haiti. Nurse Marc Julmisse prepares a bunting for a newborn. Teach someone to fish, the saying goes, and they'll eat for a lifetime. Teach a nurse to become more involved in helping people heal, and patients could enjoy a longer life. That's the philosophy behind training nurses to mentor other nurses, says Sheila Davis, chief nursing officer and chief of Ebola response for Partners in Health, the worldwide nonprofit organization. PIH introduced nurse mentorship programs in Rwanda in 2010 and Haiti in 2012 — and plans to expand to Ebola-stricken Liberia and Sierra Leone. We spoke to Davis about how raising nurses' expertise has very real benefits for patients. Why focus on training nurses? Everywhere, but particularly in resource-limited or resource-scarce settings, most of the care is delivered by nurses. According to a WHO report, nurses provide up to 90 percent of the health care in the world. There are severe [medical doctor] shortages in many resource-limited places because fewer doctors are educated per year. There is brain drain — doctors are more apt to leave their home country for other opportunities, while most nurses do not have the same option due to less standardized education. And they are the family caregivers and unable to leave. Nurses are also often the voice of patients because they are with them so much of the time. So we're trying to raise the standard of care by raising the standard of nursing. Our model is to train nurses in their own setting, rather than taking them from the health centers where they usually work to a central location to teach everyone at once. That way we can adapt training to be most effective for a particular clinic or hospital and for that particular nurse. The training is done by both expatriate nurses and local nurses. Our strategy is to transition leadership positions to the local nurses to ensure that we are building in-country expertise. Experienced mentor nurses sit in on nurse-patient interactions and give guidance as needed. The nurse-mentor can provide real-time clinical feedback, such as what questions to be sure to ask or a more effective way to phrase a question. Nurse mentors also meet with the head of the clinic to address any issues, like a lack of medication or no water. What types of things do they learn? The nurses being mentored learn critical decision-making skills — not just to take blood pressure or use the monitor but also to interpret the information. Having someone beside you who can help you adapt the information and that you can check in with gives people a lot more confidence. What's a situation in which an experienced nurse can make a difference with a patient? A woman in labor came into the clinic, but she was clearly confused about where she was and was also thrashing about in pain. People didn't know quite what to do, and so they stayed away from her. An experienced nurse approached her, talked to her gently, explained where she was and showed compassion. Some time later, this woman came back with her sister to thank the nurse. Emergency room nurses at Mirebalais Hospital in Haiti were mentored to do more on their own initiative, such as recognizing serious symptoms and identifying patients in need of immediate help. A patient was quietly sitting outside the ER waiting to be seen. Because he was so quiet — not making a fuss or complaining — he could have easily been ignored. Instead, the nurse went over and assessed him. She discovered he needed immediate attention due to his rapidly falling blood pressure. It turned out he required abdominal surgery. Mentoring gave her confidence to be able to assess the situation. 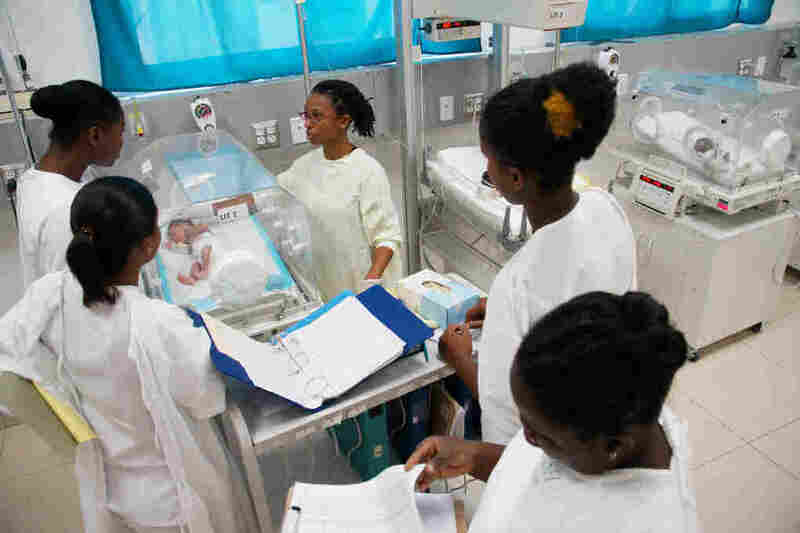 In addition, nurses are also becoming more confident using advanced equipment, such as infant monitoring in the nursery to check the baby's heartbeat and respiration. Also in Haiti, because breast cancer is often not diagnosed until much later than we usually see in the West, a nurse will often see advanced breast cancer cases where there are gaping wounds. One of the mentored nurses took the initiative and set up a wound clinic where she changed dressings, and did more advanced wound care for post-surgical patients as well as for the more advanced cases. Her care made them more comfortable, provided pain relief, gave them dignity by making them less self-conscious. How would you summarize the program's impact? It is impacting the whole country because the nurses who are mentored keep on passing that knowledge along.